My friend Joanne Neft asked me to go to Nagaland with her several years ago — Nagaland, India, a mountainous place in the Eastern Himalaya where inhabitants related to Mongolian cultures and look quite different from their countrymen to the south. Nagaland's traditions have had staying power: Just 50 years ago, warriors believed their fortunes were tied to how many heads they acquired during raids on neighboring villages. They stored the cleaned skulls in the eaves of their timber and thatch huts, stacking them properly for display. But Nagaland headhunting is over, and a visitor's crown is safe; as long as you're with a guide. After three days of travel and numerous passport inspections, Joanne, her husband, Jerry Burns, and I arrived in the Angami village of Touphema. Nikon in hand, I twisted out of the cramped jeep and saw this. One of my photography teachers, the great Norman Mauskopf, taught me to begin editing sessions by taking a close look at the first shot captured in any sequence. "The first image is usually the best," he said. "Inspect your own work and see if it's true." Ever since, I've done just that, and I've found that for me he's been right. But I really can't figure out why. It is fascinating to see what occurs when subject, camera, and I first encounter each other. Made within an astonishing split second, my first shot occurs with the least amount of planning. I notice a scene, get the camera into place and press the shutter. If I have time, I work on getting more shots and begin to analyze potential: What does this scene mean? Why am I drawn to it? What could it become if I wait a while longer? Where are the shapes and lines? Where is thelight? Considering that all of this deliberation is rooted in craft, it's especially hard to explain why the first and least-planned image is the best. Does the image result simply from an explosion of synapses and electrical currents set free by my right brain before the left brain leaps into play? Or is it that without an inner editor's meddling, a true expression occurs, escaping the rules of design, reflecting the subconscious continent so secretively shrouded in mist? 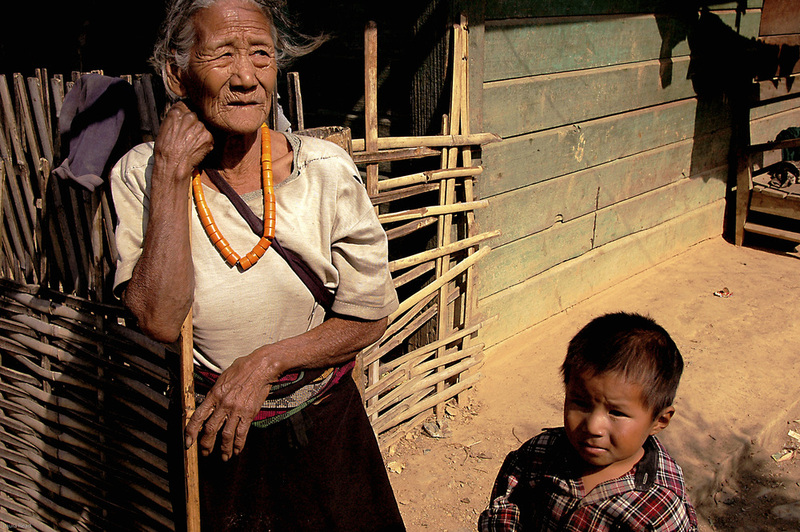 What I do know is that, of all my Nagaland images, this one of grandmother and child enchants me the most. Yes, there are the intersecting fence and building lines, the extensions of space to the left and right, and the criss-crossing avenues of sight evolving as the woman gazes one way and the boy looks another. There are also the facial expressions, which cause me to wonder what just happened, what's going to happen next, and what's occupying their thoughts? And there is the light. That's about all I can say.